The Phonebook has a tabbed interface, in which the third tab lists all contacts alphabetically. Contact images, where available, are displayed and there's a quick alphabet scroll on the right. There's also a regular search bar on top of the contacts list. The other tabs are Dial, Call log and Groups. Filters keep the phonebook from getting messy - you can choose which groups are displayed and which are hidden (e.g. Family, email contacts, Twitter contacts and so on). The list can be sorted by first or last name and you can choose how contacts are displayed - First Name, Last Name or the other way around. Quick contacts are available (tap the contact photo to get call, message, email and so on buttons) but LG has used the extra width of the Optimus Vu to include inline buttons for calling and texting contacts, which are even quicker. Tapping on the name of a single contact brings up their details. This interface is tabbed too - Info holds the basic contact information, but you can also check call history between you and the contact along with SNS updates and photos from their Facebook account. The Agenda shows events involving that person. Editing a contact is pretty straightforward; you can add or remove fields as needed, as well as specify the types of phone numbers, email addresses, ringtones and even add notes. Each phone number and email address field has inline call/message keys, which comes in handy when there are multiple numbers and emails. The LG Optimus Vu may not have the most comfortable form factor for calling but it does feature full voice and video calling functionality. It also had no trouble holding on to signal even in areas of spotty coverage and the in-call audio is consistently good too. The Dialer integrates with the rest of the phonebook. It features smart dialing and will show the matching contact (it matches both names and phone numbers) with an added downwards arrow if there are more than one. The Call log is clever and groups some of the calls, e.g. 3 missed calls from the same contact on the same day. A number next to the contact name shows the number of events. It's a great space saving feature. During a call you can pop-up the dialer should you need to dial another number. Also you can use the phone while on a call, just hit the menu key and a small green line replaces the notification area and acts like a shortcut back to the call. We also ran our traditional loudspeaker test on the LG Optimus Vu. It scored a Good result, so you probably won't be missing many calls with it. The LG Optimus Vu does all common message types: SMS, MMS and email. SMS and MMS are handled through the tabbed Message app. By default it shows you conversation mode, but the other tabs let you view the Inbox, Outbox and Saved messages. You can customize how messages are kept - all of them or up to some user selectable limit (the default is 300 SMS and 100 MMS). There's also a Spam message box with fairly sophisticated settings at your disposal for blocking spam. A press-and-hold on the text box gives you access to functions such as cut, copy and paste. You are free to paste the copied text across applications like email, notes, chats, etc. Another cool feature is that the volume rocker controls the text size. One cool and potentially very useful feature of the Optimus Vu is the reserved message - you can compose a message and schedule it to be sent out automatically at some point in the future, from within an hour to several months. There are quite a few situations where this could come in handy, for example, making sure you don't forget to send a "Happy birthday" note to someone. Gmail is part of the core Android experience. It has an optimized interface and can handle multiple Gmail accounts. The extended Gmail features include batch operations, which allow multiple emails to be archived, labeled or deleted, spam report and of course conversation-style email view mode. The generic email client supports multiple accounts, and operates in much the same fashion as the Gmail one. If you need to manage multiple accounts (even from different services), the Combined Inbox feature will come in handy, although it has no conversation-style view like in Gmail. 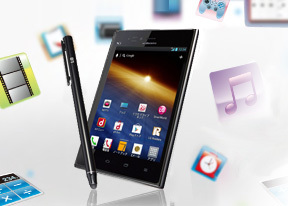 The LG Optimus Vu offers a standard QWERTY keyboard, which features both portrait and landscape orientation. The keyboard has plenty of room on the screen in portrait orientation, which makes for fast two thumb typing. If you prefer typing with just one hand, LG has you covered - swipe the keyboard left or right to reduce its width by 30% and dock it to the left or right side of the screen respectively. The swipe gesture can be set to change the input mode instead. Other input options include handwriting recognition (it handled even our poor penmanship) and a 3x4 keypad for old-school multi-tap texting (we're not sure why LG kept this option).